"Mark created facebook to get his girlfriend back", even though some people may infer this from the movie, it's interesting to note that in reality, Mark was dating a girl during the time he started facebook. He happens to be committed to her till date. @Benny, interesting, though the "committed to her till date" part isn't surprising. She wouldn't dare to break up with him, would she? The movie is inspirational, no doubt. And that is a good blog to say the least. But then, the movie, at least to me, seems to be the story told based on the accounts given by the plaintiffs in the case. It isn't a telling by Mark. It isn't the telling of an official biographer. And the few scenes where you do see Mark alone, will, at best, give you a vague idea of his emotions or thoughts, leaving behind an ambiguity and open endedness for everyone to derive what they want. It is actually a better movie than just a story. 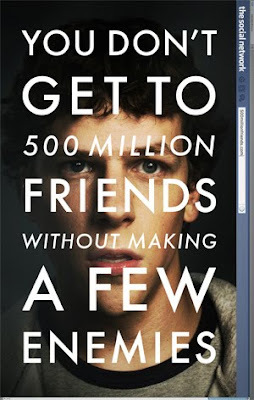 And the actor playing Zuckerberg, sorry for not googling his name, is probably the best performance I have seen this year.